The Eurolines pass is probably the best travel deal in Europe allowing unlimited coach travel between 50 destinations in 20 countries on the Eurolines network. This pass is great value particularly during summer when it is a much cheaper and more flexible travel option than the equivalent Busabout pass. The Eurolines Pass 2017–2018 programme runs from 1 January 2017 to 31 March 2018. Prices and destinations served change on 1 April 2018. It is the cheapest of European travel passes (considerably cheaper than a rail pass). It offers unlimited travel for every day of the validity of your pass (as opposed to many rail passes that only allow travel on specified travel days during the pass’s validity period). It allows a degree of spontaneity that allows you to set your travel plans as late as your travel date without the costs involved in buying higher priced tickets at the last minute. This flexibility simply isn’t possible if you have pre-booked your travel months in advance just to secure cheap tickets. Although Eurolines coaches serve over 600 destinations throughout Europe, the Eurolines Pass only lets you travel to 50 of these cities. Also the focus is on international travel and there are restrictions on domestic routes that you can travel on using the Eurolines Pass. The Eurolines Pass used to be a strictly international travel pass, which meant that each travel sector had to cross an international border; however European coach travel has been deregulated recently allowing much more flexibility with this travel pass. Although the focus of the Eurolines Pass remains on international travel, there are now several domestic coach routes that you are able to use the pass to travel on. In some instances the restrictions on domestic travel can mean that you’ll need to put some thought into planning your trip to ensure that you avoid long detours into neighbouring countries simply to travel between two domestic destinations. 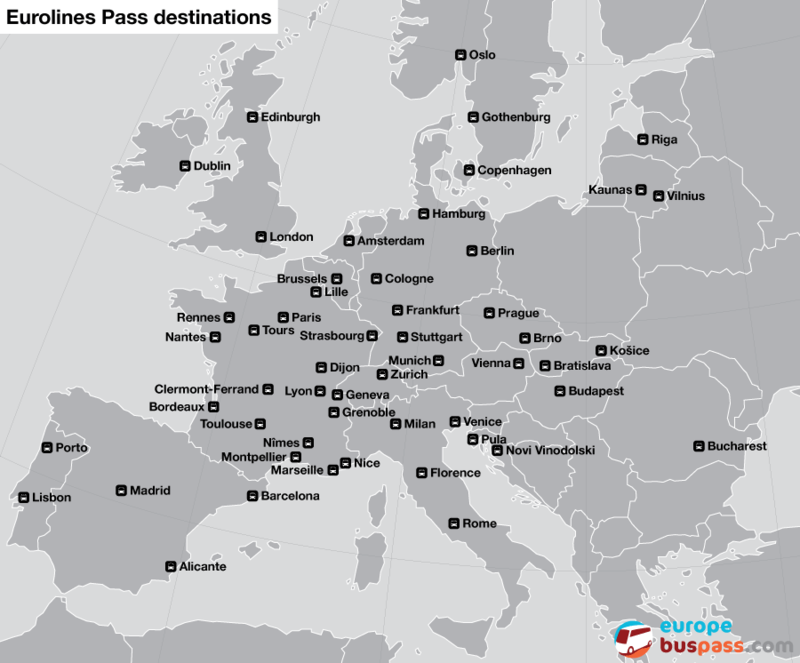 You can use your pass to travel on one single or one return journey between the same two cities (for instance Paris–Amsterdam or Paris–Amsterdam–Paris), but you cannot use your Eurolines Pass to repeat the same journey multiple times. In other words, once you have completed a trip between two cities, you are not able to repeat that same trip. Despite its limitations, the Eurolines Pass is the cheapest way to get around Europe while still allowing for a flexible travel schedule and it works out a lot cheaper than a rail pass. However to make the most of your trip you may need to supplement the pass with rail travel to make short trips to places not covered by the pass; but use the pass to cover larger distances that would be considerably more expensive by rail. The best way to get the most from your Eurolines Pass is to be aware of the limitations and budget for alternate transport options so you don’t miss out on destinations that are not covered by the pass. Even in more expensive countries, regional rail services are good value so you can save money by using the Eurolines Pass to cover long distances by coach (which would otherwise be very expensive by rail) and then travel by rail to smaller places that are not served by the pass. The Eurolines Pass lets you travel every day for the 15 or 30-day validity of the pass, so you will get the most value from your pass if you travel at least once every couple of days. However this can be an exhausting way to travel and you will enjoy your trip much more if the pass isn’t valid for the entire duration of your trip. For instance if you’re taking a two-month European trip you could combine a 30-day Eurolines Pass with a 30-day rail pass for a favourite country. A one-month long trip can be comprised of a 15-day Eurolines Pass combined with a week of slower rail travel at each end. At the very least you should spend a week at each end of your Eurolines Pass enjoying a favourite city.